Laser Quantum is a member of the International Trade Council, a network of reputable businesses operating in over 76 countries worldwide, working with a variety of external groups to maximise areas of common ground and minimise barriers to trade. 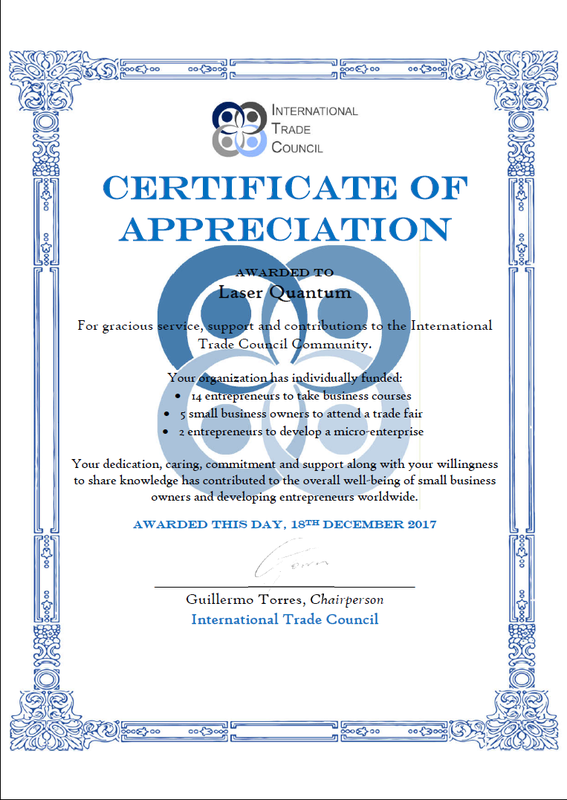 The Trade council has acknowledged Laser Quantum’s contributions to the ITC community for 2017: individually funding 14 entrepreneurs to take business courses, 5 small business owners to attend trade fairs, and for a further 2 entrepreneurs to start their own businesses. The funds raised by the ITC has also contributed to the development of a mobile medical clinic, and an animal rescue and rehabilitation project, both officially launching in 2018. Laser Quantum is a manufacturer of continuous wave and ultrafast laser products headquartered in Stockport, UK, with 3 further locations in the US and Germany. Click here to learn more about the company and see our awards and accreditations.